We’ve covered the Arizona wine scene for quite some time on our show, and this weekend’s broadcast came to you live from a place dedicated to that very story, the Arizona Wine Collective! Our celebrity co-host was Jessica Nenadic of the Tucson Museum of Art, who got us current with museum happs and her latest wine reflections. 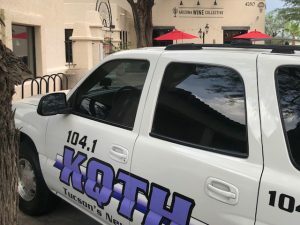 We were also joined by Gretchen Harper of the Southern Arizona Arts and Cultural Alliance, who shook up a little excitement about the upcoming World Margarita Championship. 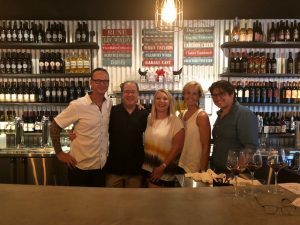 We turned the conversation back to wine with winemaker Mark Phillips of Golden Rule Vineyards and Jeanne and Pete Snell of the Arizona Wine Collective. We chatted showstopping varietals, wine as a love story, and this special place that the Snells built that’s the ideal backdrop for sharing our passion for the grape. Raise a glass in celebration of Arizona wine at Arizona Wine Collective!